This one-time retail “giant” isn’t alone on the path of reduction in force. Macy’s has announced that they will close 63 stores, and Sears will lock their doors for the final time on 150 of their stores this fiscal year. Brands too are feeling the heat. Ralph Lauren recently announced the closure of an unspecified number of stores (including its Polo store on Fifth Avenue, New York City), and a reduction in its workforce. 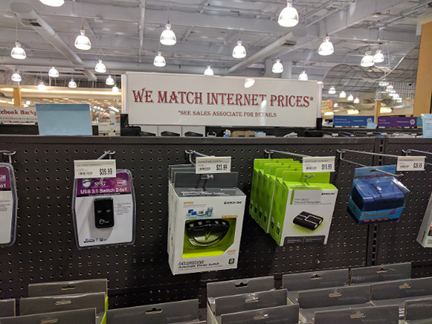 The internet is impacting brick and mortar sales the way that Sears Roebuck and Montgomery Ward catalog mail order sales impacted the general store at the turn of the last century. The disruption of the retail industry following the onset of e-commerce is largely due to the change in shopping behavior. Shoppers today can sit at home and compare multiple retailers before making a purchase. This has a significant impact on consumer expectations and how retailers do business today. Smartphone apps make comparing prices, and downloading coupons simple. So, we now see e-retailers compete tooth-and-nail on price, and even willing to take the “loss leader” route to drive adoption. Consequently, consumers expect rock bottom prices. Many brick-and-mortar retailers like Walmart have responded by simply matching online prices. While there are tens of thousands of e-commerce companies in the world today, this disruption is led primarily by the behemoth of global retail — Amazon. Amazon’s retail business strategy rests on three pillars: price perception, broad assortments, and customer experience. Price has long been the primary driving factor in retail. Therefore, there is need to optimize price efficiently to drive revenue and margins. What Amazon has smartly done is to drive the perception among shoppers that the company is always the lowest priced, even though it’s untrue. They do this by ensuring they are the lowest priced in the top 20% selling SKUs by volume. The resulting perception among consumers is a key differentiator. Also, to deliver superior customer experience compared to competing retailers, Amazon ensures high quality of online catalogs, provides a wide selection of products, and offers fast shipping to a broad coverage area, at no additional cost. When you factor in the Amazon Prime service, consumers have become spoiled with receiving their purchases within 48 hours. Sunday deliveries, and scheduling within the hour means buyers are in the driving seat. Some of Amazon’s competitors are following suit. Mega box stores like Costco, in an endeavor to meet their customers’ desire for options, are partnering with Google Express to provide fast delivery of household items, apparel, electronics, pantry staples such as bread and cereal, and more. How do I deliver a high-quality shopping experience? How can I drive price perception among shoppers? What products do I promote and when? What product assortment do I build to drive sales and retention? How do I manage my logistics to reduce shipping cost and time? Traditional retailers looked largely at only internal data — like POS data, product sell-through rates, inventory, etc. to answer these questions. Today, it is mission-critical for retailers to absorb and utilize external competitive data as well — and here lies the problem. When you are benchmarking yourself against the competition online, it is that much harder, as it’s more dynamic and significantly more complex than before. For example, Forbes estimated that through Christmas season in 2014, Amazon made a total of 80 million price changes per day to stay competitive. These are extraordinary numbers, and reflect how dynamic online retail is, and its contrast to traditional retail. Retailers today have no choice but to automate as much as possible, so they can make quick, timely merchandising decisions and keep pace with modern e-retail. Retail technology providers like DataWeave have stepped in to meet this demand. At DataWeave, we enable retailers gain a competitive advantage in the online world by providing Competitive Intelligence as a Service. We do this by harnessing public information on the competition, structuring it, and presenting it in a form that is easily consumable and actionable, enabling easy, automated decision-making. Our AI-based technology platform facilitates smarter pricing decisions by providing retailers with price change (increase and decrease) opportunities as they occur. Retailers can also plug gaps in their product portfolio by identifying opportunities to expand their assortments. In addition, they can benchmark their shipping speed and cost against competition, to enhance customer experience. And there’s more where these come from! Click here to find out more about how we can help modern retailers stay competitive in the online world.